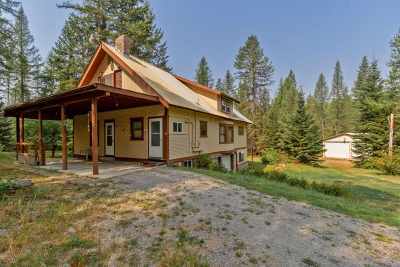 Amazingly original 1910 Spokane Craftsman, relocated in 70&apos;s to almost 100 acres of beautiful Stevens Co. forest w/year-round pond. Original woodwork on molding, windows, doors, floors, ceilings. Nice upstairs remodel complete except for bedroom doors. Beautiful basement & main floor fireplaces. Laundry connections on all three floors. New 12x30 Trex deck 2006. Wiring updated in 70&apos;s. Approx. 3700 sq. ft. including underhouse garage. 30x40 shop on foundation and full slab w/16x12 & 10x12 roll-up doors.